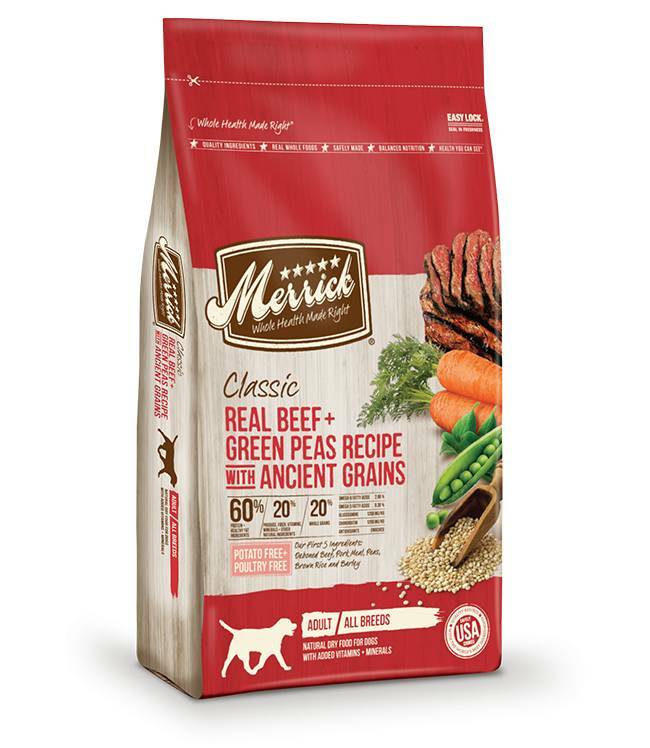 Merrick Classic has long provided dogs best-in-class natural nutrition from a wholesome balance of protein, whole grains and fruits and vegetables. Merrick Classic has long provided dogs best-in-class natural nutrition from a wholesome balance of protein, whole grains and fruits and vegetables. Merrick Classic recipes now have been improved to offer an even more palatable and easily digestible mealtime experience for the Best Dog Ever – plus refreshed premium packaging at an attractive value for pet parents. Merrick Classic dry recipes start with real deboned meat as the first ingredient to provide leading levels of quality protein, and also include farm-fresh fruits and vegetables like carrots, apples, blueberries, peas and more. Recipes also feature a healthy blend of whole grains – now with ancient grains like quinoa. Deboned Beef, Pork Meal, Peas, Brown Rice, Barley, Pork Fat (preserved with mixed tocopherols), Lamb Meal, Natural Flavor, Pea Protein, Oatmeal, Quinoa, Beef Liver, Salmon Meal, Carrots, Apples, Flaxseed Oil (source of Omega-3 fatty acids), Blueberries, Chia Seed, Organic Dried Alfalfa Meal, Salt, Choline Chloride, Minerals (Iron Amino Acid Complex, Zinc Amino Acid Complex, Zinc Sulfate, Sodium Selenite, Manganese Amino Acid Complex, Copper Amino Acid Complex, Potassium Iodide, Cobalt Proteinate, Cobalt Carbonate), Yucca Schidigera Extract, Vitamins (Vitamin E Supplement, Vitamin B12 Supplement, Vitamin A Acetate, d-Calcium Pantothenate, Thiamine Mononitrate, Niacin, Riboflavin Supplement, Biotin, Vitamin D3 Supplement, Folic Acid, Pyridoxine Hydrochloride), Dried Lactobacillus plantarum Fermentation Product, Dried Lactobacillus casei Fermentation Product, Dried Enterococcus faecium Fermentation Product, Dried Lactobacillus acidophilus Fermentation Product.